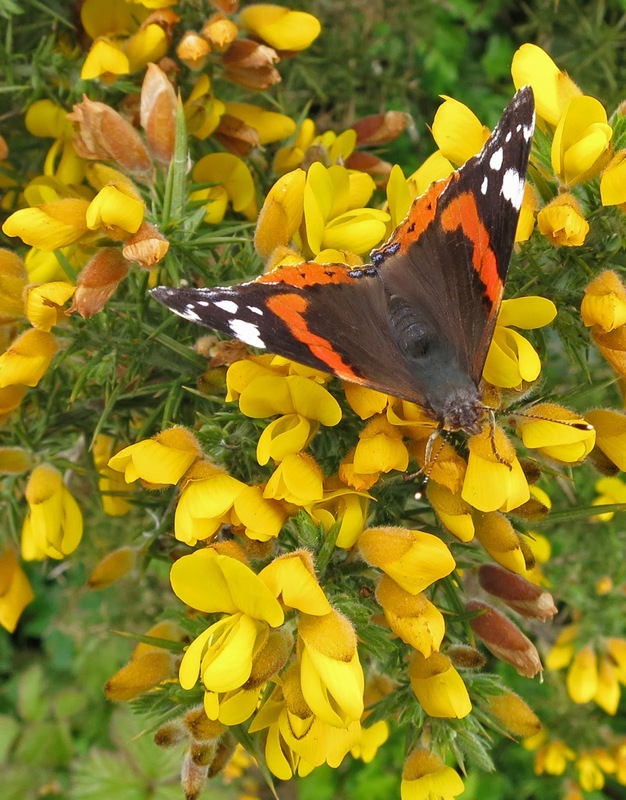 Red Admiral butterfly (Vanessa atalanta) on gorse flowers. I belong to a Google Circle for garden bloggers. This isn't a garden blog so I count it a privilege to have been invited to join. Over the last week, there's been an interesting and extended discussion about copyright, watermarking, meta-data etc. . . . and always in the background is the question of whether or not we are happy for our photographs to be used by others. I've found this very helpful in re-crystallising how I feel about my own pictures and as I think it is different from many (possibly most) other bloggers, Diana Studer (of Elephant's Eye) suggested I write a post to make this clear. Good idea! If you use one of my photos on your site and let me know, I will be pleased. If you link back to Loose and Leafy, I'd appreciate it but it isn't necessary and I won't be offended if you don't. 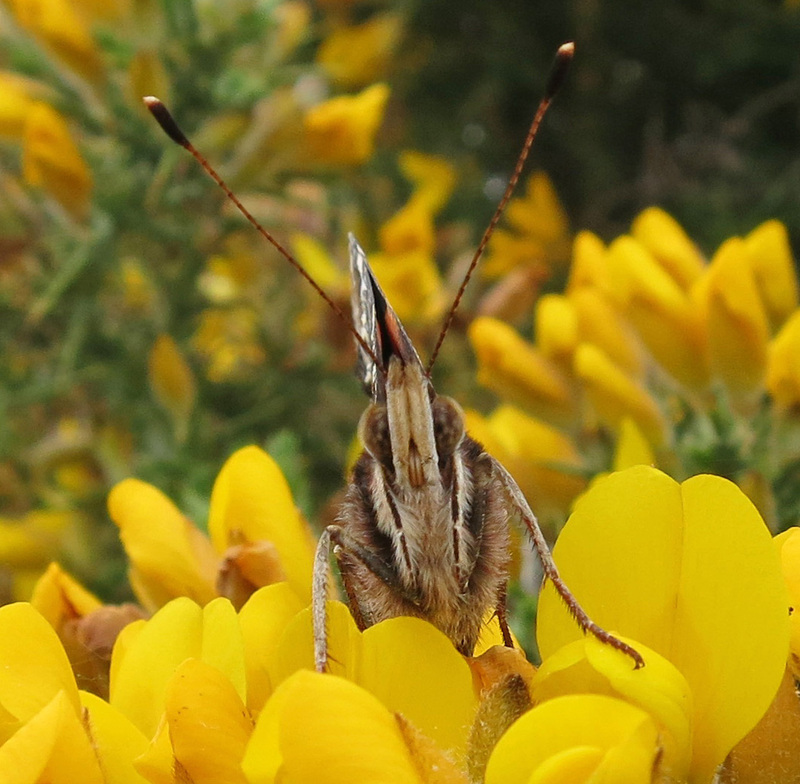 However, I would definitely like you to mention it was me - Lucy Corrander - who took the photo. Red Admiral Butterfly (Vanessa atalanta) with its wings closed. BUT . . . and this is a really, really, really important 'but'. You must bear in mind I am not a naturalist. I try to ensure my identifications are accurate but mistakes will, inevitably, creep in from time to time. If you use any of my pictures, you must either make sure to your own satisfaction that the ID is correct, or say you can't guarantee it. AND because I have sometimes realised a mistake after uploading it to the blog, the incorrect ID may still be attached to some pictures, even if corrections have been made in the blog itself. SO it would be a good idea to check this before you use an image. If you put your cursor on a picture and right click and chose 'Inspect Element' from the drop down list, you will see details of the picture highlighted. This will generally include the date the picture was taken as well as the ID. If you have doubts - download the picture onto your computer and remove the ID, leaving the other information - image number, date, my name etc. in place. Is that ok? None of this applies to the text on this blog - only the pictures. If you'd like to paraphrase the information, please feel free to do so - remembering to check I'm right! - but don't simply copy and paste what I've written about anything. I suspect I will want to change the way I've said this from time to time, phrase it better. Some of you may also see that I've missed things out or been unclear . . . (mention it, please!) I'll put all this under a tab at the top of the page soon so if ever you want to refer to it - you can. *Urban setting - those pictures which include human made things like cars, buildings, pavements, drains, street lamps, trains . . . those kinds of things. I wouldn't use anyone's pictures without permission, but that is the way I was brought up - always ask permission. You say that you have reduced the quality of your pictures - I certainly can't see that, even magnified they are superb. I love the first one in particular. Hi, Toffee Apple. The pictures on this particular post are cropped from larger ones so their dimensions are smaller than they would be if the whole picture were to be used so they are crisp on screen but wouldn't enlarge well. If you were to print them, you'd want the whole image to make a good picture. When I use the whole picture on the blog(which is more often than not) I reduce the number of pixels. This means when you enlarge them on the screen they are a bit muzzy. I have learn't so much and downloaded so many free programmes from the internet. It is a free environment. Good on you girl, I meant to flatter with 'girl' but good on you Ma'am is much more respectful. I did it months ago. All my snaps are free. Donations to my bad habits are, of course, gratefully received. We snappers can get a we bit precious. It's only an image. If someone wants it at full resolution then they will pay. Funny enough they do....not often enough but once or twice a year is enough. Hi Adrian. Glad to be in harmony. Hello Linda. For all that Red Admirals are common, they are so flamboyant one feels they ought to be rare. Glad you like the portraits of this one. I think that's very nice of you! superb. I love the first one in particular. I don't worry much about my pictures being used unless it's for profit, but I do like to see due credit given. I came across one of my rose ones on a Seattle newspaper website duly credited which pleased me. Terrific butterfly pictures, especially the first one. I just wish that they were easier to photograph! Hi there - nice pictures and nice part of the world! I used to live a bit north and east of you!! good to have that all cleared up, especially if you keep the info available on a tab. I prefer to use lots of links in my blog posts. To me, it is a courtesy to the blogger to leave their image in their chosen setting, and to lure new readers their way. Perhaps I'm just not enough of a photographer to enjoy being used as a random 'illustration'. (Do I see a hint of your one day book between the lines?!) Maybe you can disable rightclick on the images you do want to protect? Hi Pearl. One less thing to worry about - let the birds fly! Glad you like the butterfly photos Shifan. Thanks. Hi, Flighty. That's exactly it. If I came across a photo like that, I'd be chuffed! 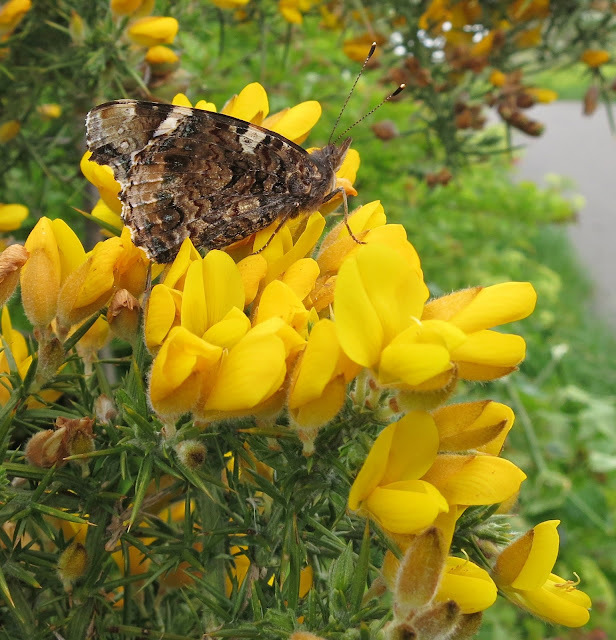 Butterflies - the light was low, the bush was being blown about in the wind, the butterfly itself was quivering. So I just kept taking pictures in the hope something would come out unblurred - and I was lucky. Hi Diana. That's an interesting and puzzling way of putting it. I do try to make my pictures interesting as well as informative but the hedgerow and seashore ones really are about the subject matter rather than about me. On the other hand . . . why do I blog? In part it's because I enjoy it - I like the process of taking the pictures, putting them on the page, writing the text. I find it satisfying in its own right. And partly so others can share in the delights of the area in which I am privileged to live. If it's a pleasure / informative for anyone to see any of these pictures of plants and insects here, if they stand up in their own right, it will probably be equally so on another site too. If I were a commercial site, I might feel differently. But I'm not. I'm just me - and glad there are so many people who enjoy visiting me (or rather the content!) on Loose and Leafy. I don't know how to disable right clicking on pictures and am not clear how this would help. It might be an interesting challenge for Google - to provide a way to 'lock' pictures on a page so those which one really doesn't want to pass on can't be copied. Hello Hollis - meta-data . . . I don't understand how to find what meta-data (if any) photos uploaded onto blogger blogs take with them. On my laptop there's all sorts of stuff about camera, exposure time etc. Examining the element on the blog seems only to show the details I've put along with the image number so I try to remember to include my name and blog name along with the image number / picture name. oh! sorry Lucy, I wasn't clear. I meant "metadata" for my blog. Perhaps I should have said meta-info -- tags, about me, about use of photos, etc. where it says it indicates 'a concept which is an abstraction from another concept' . . . and that, I think, has thrown me even further off the scent. Looking forward to browsing the enhanced metas on your blog - the abouts and things. It's difficult to know what to do with photos put out in blogs. I don't really want to go down the route of putting my name on all of them as it too easily blocks the image - mainly though I'm photographing my veg and flowers and they seem unlikely things for anyone to want to copy. These are wonderful butterfly photos - I'm amazed you could get that close to them. First off, I really like this new look to your blog. I wish I had the energy to focus more on my images, I tend to post them, add a few tags etc, but rarely see or know what happens to them afterwards. I haven't even got my head around adding watermarks yet! I discovered one of mine on another website once which was irritating, purely because they didn't ask, but when asked I'm always happy to say yes as I feel it's quite an honour! As mentioned above - I love your images too - they bring a freshness to your blog - inspirational! You have an interesting blog! Well done.